A SQL Database server is a logical construct that acts as a central administrative point for multiple single or pooled databases, logins, firewall rules, auditing rules, threat detection policies, and failover groups A SQL Database server can be in a different region than its resource group. The SQL Database server must exist before you can create the Azure SQL database. All databases managed by a SQL Database server are created within the same region as the SQL Database server. A SQL Database server is distinct from a SQL Server instance that you may be familiar with in the on-premises world. Specifically, the SQL Database service makes no guarantees regarding location of the databases in relation to the SQL Database server that manages them, and exposes no instance-level access or features. In contrast, the instance databases in a managed instance are all co-located - in the same way that you are familiar with SQL Server in the on-premises world. When you create a SQL Database server, you provide a server login account and password that has administrative rights to the master database on that server and all databases created on that server. This initial account is a SQL login account. Azure SQL Database supports SQL authentication and Azure Active Directory Authentication for authentication. For information about logins and authentication, see Managing Databases and Logins in Azure SQL Database. Windows Authentication is not supported. Can contain logins similar to those in instances of SQL Server on your premises that are granted access to one or more databases on the server, and can be granted limited administrative rights. For more information, see Logins. The default collation for all databases created on a SQL Database server is SQL_LATIN1_GENERAL_CP1_CI_AS, where LATIN1_GENERAL is English (United States), CP1 is code page 1252, CI is case-insensitive, and AS is accent-sensitive. You can create the Azure SQL database's resource group ahead of time or while creating the server itself. There are multiple methods for getting to a new SQL server form, either by creating a new SQL server or as part of creating a new database. To create an Azure SQL Database server (without a database) using the Azure portal, navigate to a blank SQL server (logical server) form. To create an Azure SQL database using the Azure portal, navigate to a blank SQL Database form and provide the requested information. 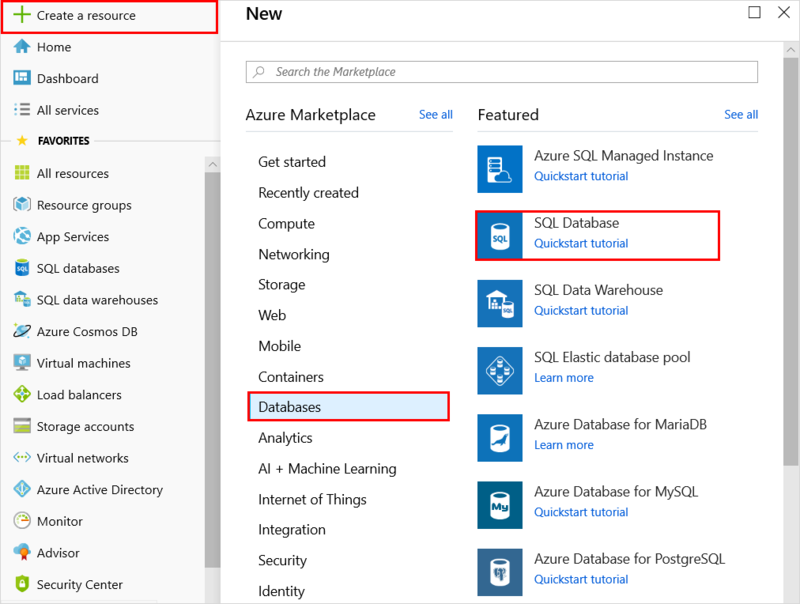 You can create the Azure SQL database's resource group and SQL Database server ahead of time or while creating the database itself. You can create a blank database or create a sample database based on Adventure Works LT.
For information on selecting the pricing tier for your database, see DTU-based purchasing model and vCore-based purchasing model. To manage an existing server, navigate to the server using a number of methods - such as from specific SQL database page, the SQL servers page, or the All resources page. To manage an existing database, navigate to the SQL databases page and click the database you wish to manage. The following screenshot shows how to begin setting a server-level firewall for a database from the Overview page for a database. To configure performance properties for a database, see DTU-based purchasing model and vCore-based purchasing model. For an Azure portal quickstart, see Create an Azure SQL database in the Azure portal. To create and manage Azure SQL server, databases, and firewalls with Azure PowerShell, use the following PowerShell cmdlets. If you need to install or upgrade PowerShell, see Install Azure PowerShell module. For creating and managing elastic pools, see Elastic pools. Remove-AzSqlServerFirewallRule Deletes a firewall rule from a server. New-AzSqlServerVirtualNetworkRule Creates a virtual network rule, based on a subnet that is a Virtual Network service endpoint. For a PowerShell quickstart, see Create an Azure SQL single database using PowerShell. For PowerShell example scripts, see Use PowerShell to create an Azure SQL single database and configure a firewall rule and Monitor and scale an Azure SQL single database using PowerShell. To create and manage Azure SQL server, databases, and firewalls with the Azure CLI, use the following Azure CLI SQL Database commands. Use the Cloud Shell to run the CLI in your browser, or install it on macOS, Linux, or Windows. For creating and managing elastic pools, see Elastic pools. For an Azure CLI quickstart, see Create an Azure SQL single database using the Azure CLI. For Azure CLI example scripts, see Use CLI to create an Azure SQL single database and configure a firewall rule and Use CLI to monitor and scale an Azure SQL single database. To create and manage Azure SQL server, databases, and firewalls with Transact-SQL, use the following T-SQL commands. You can issue these commands using the Azure portal, SQL Server Management Studio, Visual Studio Code, or any other program that can connect to an Azure SQL Database server and pass Transact-SQL commands. For managing elastic pools, see Elastic pools. You cannot create or delete a server using Transact-SQL. CREATE DATABASE (Azure SQL Database) Creates a new database. You must be connected to the master database to create a new database. ALTER DATABASE (Azure SQL Database) Modifies an Azure SQL database. ALTER DATABASE (Azure SQL Data Warehouse) Modifies an Azure SQL Data Warehouse. DROP DATABASE (Transact-SQL) Deletes a database. sys.database_service_objectives (Azure SQL Database) Returns the edition (service tier), service objective (pricing tier), and elastic pool name, if any, for an Azure SQL database or an Azure SQL Data Warehouse. If logged on to the master database in an Azure SQL Database server, returns information on all databases. For Azure SQL Data Warehouse, you must be connected to the master database. sys.dm_db_resource_stats (Azure SQL Database) Returns CPU, IO, and memory consumption for an Azure SQL Database database. One row exists for every 15 seconds, even if there is no activity in the database. sys.resource_stats (Azure SQL Database) Returns CPU usage and storage data for an Azure SQL Database. The data is collected and aggregated within five-minute intervals. sys.database_connection_stats (Azure SQL Database) Contains statistics for SQL Database database connectivity events, providing an overview of database connection successes and failures. sys.event_log (Azure SQL Database) Returns successful Azure SQL Database database connections, connection failures, and deadlocks. You can use this information to track or troubleshoot your database activity with SQL Database. sys.firewall_rules (Azure SQL Database) Returns information about the server-level firewall settings associated with your Microsoft Azure SQL Database. sp_delete_firewall_rule (Azure SQL Database) Removes server-level firewall settings from your SQL Database server. This stored procedure is only available in the master database to the server-level principal login. sp_set_database_firewall_rule (Azure SQL Database) Creates or updates the database-level firewall rules for your Azure SQL Database or SQL Data Warehouse. Database firewall rules can be configured for the master database, and for user databases on SQL Database. Database firewall rules are useful when using contained database users. sys.database_firewall_rules (Azure SQL Database) Returns information about the database-level firewall settings associated with your Microsoft Azure SQL Database. sp_delete_database_firewall_rule (Azure SQL Database) Removes database-level firewall setting from your Azure SQL Database or SQL Data Warehouse. For a quickstart using SQL Server Management Studio on Microsoft Windows, see Azure SQL Database: Use SQL Server Management Studio to connect and query data. For a quickstart using Visual Studio Code on the macOS, Linux, or Windows, see Azure SQL Database: Use Visual Studio Code to connect and query data. To create and manage Azure SQL server, databases, and firewalls, use these REST API requests. Servers - Create or update Creates or updates a new server. Servers - Delete Deletes a SQL server. Servers - Get Gets a server. Servers - List Returns a list of servers. Servers - List by resource group Returns a list of servers in a resource group. Servers - Update Updates an existing server. Databases - Create or update Creates a new database or updates an existing database. Databases - Delete Deletes a database. Databases - Get Gets a database. Databases - List by elastic pool Returns a list of databases in an elastic pool. Databases - List by server Returns a list of databases in a server. Databases - Update Updates an existing database. Firewall rules - Create or update Creates or updates a firewall rule. Firewall rules - Delete Deletes a firewall rule. Firewall rules - Get Gets a firewall rule. Firewall rules - List by server Returns a list of firewall rules. To learn about migrating a SQL Server database to Azure, see Migrate to Azure SQL Database. For information about supported features, see Features.